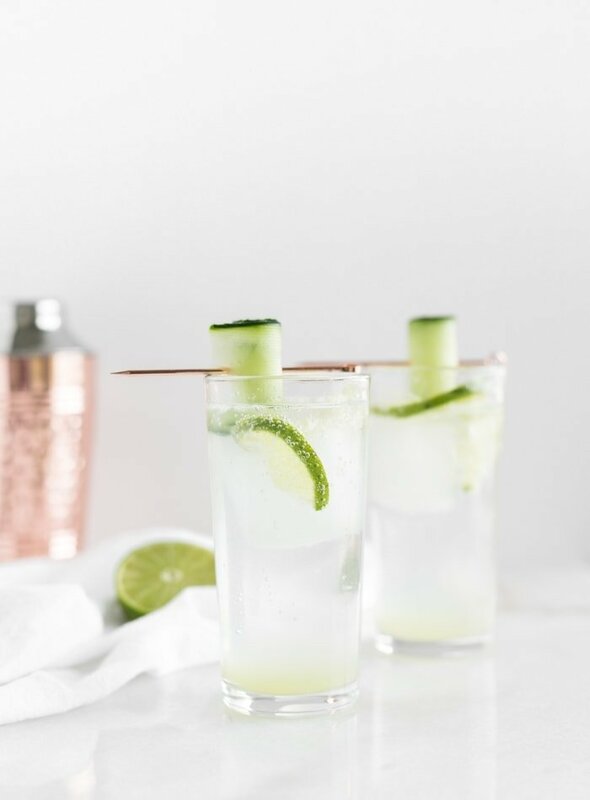 A crisp and refreshing white linen cocktail made with gin, elderflower liquor, cucumber, lime and soda is the perfect drink for your spring and summer celebrations! OR you could hang out at home and spend some quality time with your family and friends on your own patio, creating exactly the experience you want and making memories that will last forever. Mr. Table and I much prefer the latter. We are all about entertaining at home, relaxing on our own back porch, and preparing delicious food and cocktails for our friends. Not only do we save a little money by not buying $12 cocktails, but we end up having a much better time than if we were to go out somewhere. During spring and summer months (okay, during all months really) I prefer crisp, clean cocktails that are easy to make. This White Linen cocktail fits the bill perfectly. It’s a little sweet, a little tart, and a wonderfully refreshing for hot summer days. It only has 5 easy ingredients so you can spend less time behind the bar and more time enjoying your company. I first had a version of this white linen cocktail at one of our favorite restaurants in Dallas, R+D Kitchen. I didn’t know what I wanted to drink when I approached the bar, so the bartender made me one of these. It was the perfect balance of sweet and crisp, and very refreshing on a hot evening. I knew immediately I had to replicate it at home. It was called something different, and I couldn’t find it on any of the menus online after moving away, so I searched the ingredients online to find a similar cocktail called a white linen. If you’re looking for delicious cocktail suitable for the slow, lazy days of summer when all you want to do is relax with a drink and your hubby or best friend, you’ve got to make a white linen. This cocktail and your patio is all you need for easy entertainment to carry you all the way through summer! Cheers! A crisp and refreshing white linen cocktail made with gin, elderflower liquor, cucumber, lime and soda is the perfect drink for your summer celebrations! Muddle cucumber slices in a shaker. Add ice, lime juice, gin, and elderflower liqueur and shake vigorously. Strain mixture into a cocktail glass filled with ice. Top with soda and stir. Garnish with lime and cucumber slices, if you wish. Enjoy! This post was originally published May 25, 2017 and has been updated.